Hello Linux Geeksters. As you may know, Sweet Home 3D is an open source interior design application, allowing the users to easily rearrange their house. Among others, in allows the users to draw walls and rooms on existing plans, drag and drop windows, doors and others from the catalog to the plan, modify color, texture size and orientation of the furniture, ceilings, floors and walls, view the changes in 3D, import and export plans, etc. Fixed printing of textured floors under Mac OS X with Java 7 / 8. Fixed an issue on the 3D view displayed in a separate window on a second screen under Mac OS X with Java 7 / 8. Fixed a crash in the furniture import wizard on some configurations running Mac OS X with Java 7 / 8. Upgraded Java 3D version to 1.6.0-pre11 / JOGL 2.2.4 for the Mac OS X version run with Java 7 / 8. Increased max memory used by Sweet Home 3D under Windows 64 bit. Updated certificate used to signed programs. Other minor bugs fixes and enhancements. 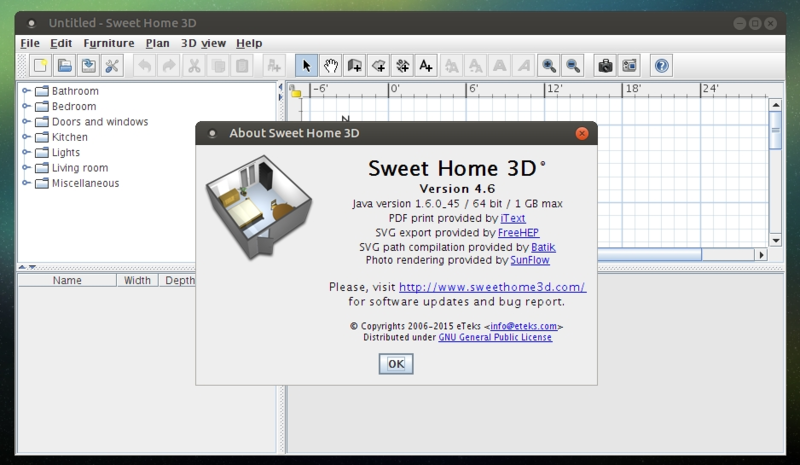 In this article I will show you how to install Sweet Home 3D 4.6 on Ubuntu, Linux Mint, Pinguy OS, Elementary OS, Deepin, Peppermint, LXLE, Linux Lite, Debian, Fedora, CentOS, OpenSUSE, Mageia, OpenMandriva, Arch Linux and Manjaro. Because it is not available via any repository or PPA, we have to download the Sweet Home 3D archive, extract it and run the application. Follow the instructions for your system’s architecture exactly.